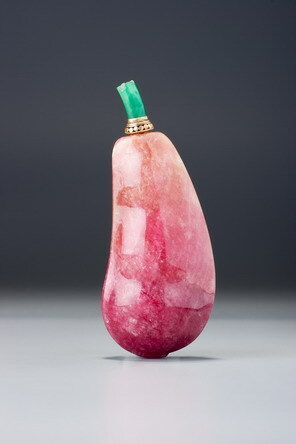 On this type of rose quartz, see Sale 2, lot 86. Botanical subjects were a staple among eighteenth- and early nineteenth-century snuff bottles, and apparently very popular at court (see discussion in Treasury 1, no. 62, or Sale 2, lot 14) and there is no reason why this should not have been a courtly product, although it is equally likely to have been a private one. There is an amethyst-coloured glass equivalent known (Moss 1971a, no. 251) and another in jadeite (Sotheby’s, London, 17 December 1996, lot 403). A group of the same form in different materials may be clue to an Imperial type, and the jadeite example cannot have been much earlier than the last decade or two of the eighteenth century, which may help to date the group. The hollowing is adequate and functional but not excessive, presumably in order to keep the depth of colour, and the exterior carving is excellent with beautifully rounded contours, well carved botanical details where the two halves of the pod join and an even, high-gloss polish. 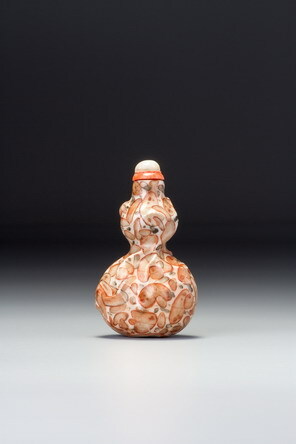 It is one of the masterpieces in this unusual material for the snuff bottle.